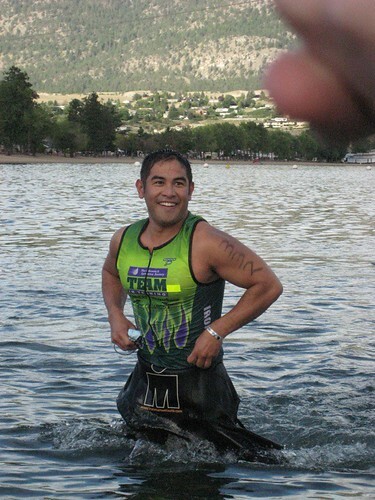 This was the 25th anniversary of Ironman Canada and my fifth Ironman race overall (four Canada and one in Arizona). This was also my second race within a year which wasn't actually that bad. — This year I drove (w/ Mom) and it was a stupid thing to do. We drove to Seattle and then headed up to Penticton. It's just too long a drive and I was tired before and after the race. The drive was harder than the race itself but I love my car. The X3 aka Greta rocks. — The race itself was good. Did it with IronTeam again. I know the course pretty well now and the people are great; Penticton is such a beautiful place and Canadians are really nice. — I wanted to do the race in 12:30 or even 13:30 but ended up with a 13:51 time which is fine. I'll come back again and do better one day. There was nothing different from last year except that there was more people, the weather was nicer (except for some wind), and I was able to run most of the first half of the marathon. I'm glad I'm not doing another race for a while and I guess with five Ironman completions under my belt I can chill out for a few years and find something new. To think I've spent five days out of my life where that whole day was spent swimming, biking, running, in total it's 12 miles of swimming, 560 miles of cycling, 131 miles of running for those 5 days. It's a little crazy. I'm closing in on another Ironman season so doing some reflection. Training for an Ironman isn't the most safe thing in the world. Every time I get in the water, I think about drowning and potential for drowning whether it's at the pool or at Aquatic Park or at an event. When I swallow some water sometimes I remember that and when I first get in, I remember it. The bike is probably the most dangerous because at any time I can get hit by a car for no good reason. I could also just fall off my bike and I do reach 50+ mph on descents. My biggest fear is descending 30-40 mph on my bike and a car swerving to avoid a bicyclist on the other side of the road comes into my lane and we both hit each other. The run, well, I've almost lost my legs a couple times. People don't stop at stop signs when they drive, they do what's called the California rolling stop. Oh, and I could also die from over exertion, hyponatremia (basically drink too much water and drown my lungs), or just pop my heart from getting my heart rate up to redline (I get pretty close sometimes). Being able to swim in the Caribbean (Cayman Islands, Turks & Caicos) and swim and snorkel in Hawaii…pretty cool. Doing a 100 mile bike ride with friends in Marin where Levi Leipheimer trains and enjoy the sights, Tomales Bay, Redwood trees, as well as enjoying the Berkeley Hills and other beautiful places in the Bay Area bike…pretty cool. And to run through the streets of Oakland and Berkeley and Alameda and wherever and discovering new places to eat, places to shop, enjoying the sights, and just seeing people on the street…pretty cool. So, I'm actually nearer to death when I don't swim, bike, run, take risks, and live life.